Beovox S 45 was the smallest and least well specified of the revised Uniphase range. 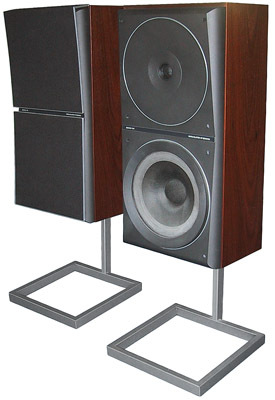 The cabinet was the same size as the more expensive S 55 and S 80 models from the front, but it was shallower, and fitted only with an 8½" woofer and a 1” dome tweeter, making it the only 2-way model in the revised range. As a further cost-cutting measure, the DIN connector at the rear was omitted and the lead made captive. Text copyright © Beocentral. Unauthorised reproduction prohibited.